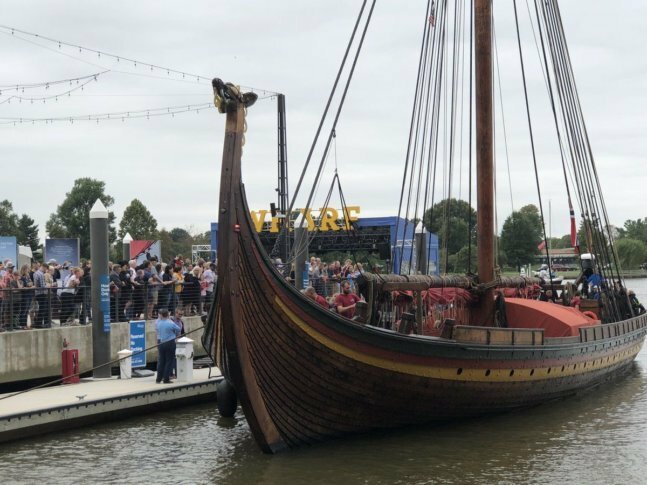 The Draken Harald Hårfagre will be docked at The Wharf’s Transit Pier, along D.C.'s Southwest waterfront, through Oct. 15. WASHINGTON — These Vikings come in peace. The Norwegian Viking ship Draken Harald Hårfagre — “a reconstruction of what the Norse Sagas refer to as a ‘Great ship'” — will be docked at The Wharf’s Transit Pier through Oct. 15. “We have taken Washington, without any warfare,” owner Sigurd Aase joked. Aase hopes visiting the ship will inspire people “to reflect” and leave them curious about Vikings and Scandinavia. Ticket prices for deck tours are $12 for adults and $6 for kids. A family pack of two adults and up to three kids is $30. When the Draken came up the Potomac River to dock at the Southwest D.C. waterfront, the wind was coming from the wrong direction for its bright crimson sail to be unfurled. The sail might be put up however, if the wind is right when the Draken leaves town the evening of Oct. 15.